Western North Carolina is historically abundant in quantities of rainfall, surface water, and groundwater that contribute to the headwaters of regional river basins, which provide water to both local residents and downstream southeastern cities. This discussion addresses water quantity and use. For information regarding river basins and water quality, please see sections entitled Natural | Water | River Basins and Natural | Water | Water Quality. While past water supplies have been more than adequate, recent droughts have raised public concern and heightened awareness on the issues of water use and conservation. Data provided by the United States Geological Survey’s 2005 water use study indicates a wide distribution of water usage for the 27 counties of Western North Carolina. The average water withdrawal per day in 2005 was 1,724 million gallons, with over 95 percent coming from surface water sources and the remainder coming from groundwater from largely private homeowner wells. Many municipal water supplies in the region depend, at least partially, on surface water from watersheds in the Pisgah, Nantahala, and Cherokee National Forests – lands that were set aside a century ago for the purpose of protecting the water supply and allowing regional aquifer recharges. The national forests provide high-quality sources of clean water due to the conditions that produce relatively reliable water runoff, which yields water low in contaminants when compared with many urban and agricultural land uses. Groundwater collected in wells remains a sole resource for drinking water in much of the rural parts of the region. These wells normally have depths that range from 20 to 1,200 feet, but a growing population demands that many more wells be drilled. Information on this desired yet limited resource is not well documented. This issue leaves many small towns fully dependent on wells from local fractured-bedrock aquifers concerned about maintaining a water supply sufficient to support ongoing economic development and continued population growth. Categories of water usage include: public water supply, domestic self-supplied, industrial self-supplied, irrigation (collected for both crop and golf course use), livestock, aquaculture (fish farming), mining, and power plant cooling. The public water supply category includes all uses supplied by residential, commercial, industrial, and institutional uses in the public water systems. Domestic self-supplied also involves residential well usage. Although many people think of water supply being primarily linked to the water that comes from their tap, the two major use categories in Western North Carolina are aquaculture and cooling for thermoelectric power plants. Much of the water withdrawn for use in these operations is treated and then returned to the source a short distance downstream. However, in times of drought, these two important sectors of the economy could be very heavily impacted if there is not sufficient water to meet their demand. Daily withdrawals during regular, non-drought conditions are 969 million gallons per day for aquaculture, and 521 million gallons per day for the cooling of power plants. 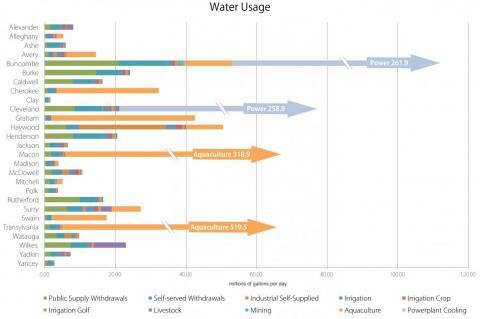 Together, these two categories account for 86 percent of total water usage from only four of the region’s counties – Transylvania and Macon Counties for aquaculture use and Buncombe and Cleveland Counties for power plant cooling. Note that the region-wide average – which includes the high-usage operations – does not often represent true local conditions among the other counties within the region. When looking at the data, other trends become apparent. Only one county, Haywood, uses the majority of its water for self-supplied industry – its paper plant. 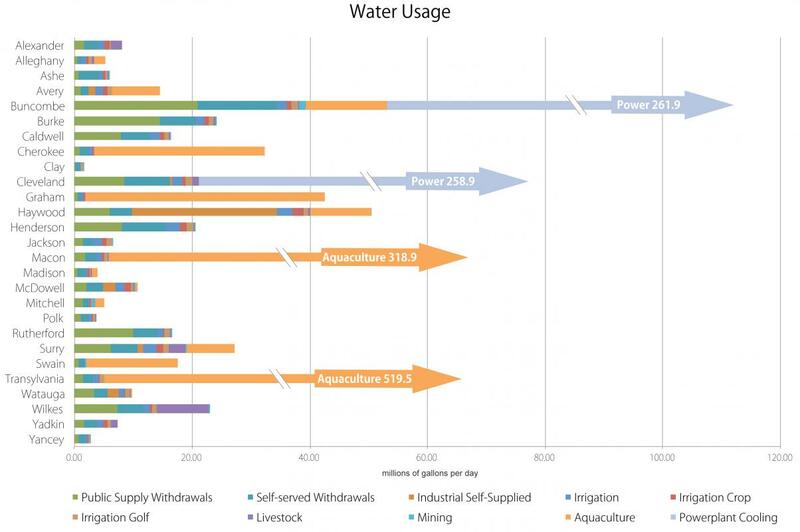 Also, agricultural water usage is remarkably low – less than two percent of all total water use. In fact, we use more water for irrigating our golf courses than we do for irrigating our crops. Despite expectations for water usage to increase from development and population growth, water use trends over the past 20 years have shown decreases in many areas due to changes in the manufacturing base of the economy, conservation practices, treatment efficiencies, leak detection, incentive programs, and public education. J.F. Kenny, N.L. Barber, S.S. Hutson, K.S. Linsey, J.K. Lovelace, and M.A. Maupin. 2009. Estimated use of water in the United States in 2005. U.S. Geological Survey Circular 1344. 52 p. Accessed from: http://pubs.usgs.gov/circ/1344/.